I had the opportunity to be in the audience during the above talk. You might notice my impolite interjections; I have often been accused of being very poor at hiding my real reactions and feelings. There is a reason why I stopped playing poker during game nights on the USS Stonewall Jackson. I was losing my shirt. Amory Lovins – Since August ought 5, the US has offered 100 plus percent construction subsidies for new nuclear plants plus operating subsidies slightly bigger than wind power gets without making a single reactor financeable with private risk capital. Let’s take each one of those individually. Since Lovins specifically mentions August 2005, he is presumably referring to the nuclear incentives offered by the Energy Policy Act of 2005. That act includes provisions for a modest loan guarantee program that has so far resulted in a $6.5 billion dollar loan (not a subsidy, but fully repayable by the borrower) split between the Georgia Power Company (a subsidiary of the Southern Company) and Oglethorpe Power Corporation. Those are two of the three partners in the Vogtle units 3 and 4 nuclear power plant project, which is currently estimated to have a total project cost nearing $15 billion. Surely, that loan guarantee program cannot be what Lovins was describing as a 100 plus percent construction subsidy. Perhaps he is referring to section 638 of the act, which is titled STANDBY SUPPORT FOR CERTAIN NUCLEAR PLANT DELAYS. That includes the following clause — subject to about half a page worth of conditions. (B) not more than $500,000,000 per contract. That clause includes the 100 percent statement, but it is not exactly a “100 plus percent construction’ subsidy. This statement compares the clause in the EPA 2005 applicable to wind (Section 1301 – Extension and Modification of Renewable Electricity Production Credit) against the one that is applicable to advanced nuclear (Section 1306 – Credit for Production from Advanced Nuclear Power Facilities). Both sections include numerous terms and conditions; the one applicable to renewable electricity like wind is a modification of an existing law, specifically 26 U.S. Code § 45 – Electricity produced from certain renewable resources, etc. Here is what that section of the US Code says; it has been modified several times since 2005. The 1.5 cent amount in subsection (a), the 8 cent amount in paragraph (1), the $4.375 amount in subsection (e)(8)(A), the $3 amount in subsection (e)(8)(D)(ii)(I), and in subsection (e)(8)(B)(i) the reference price of fuel used as a feedstock (within the meaning of subsection (c)(7)(A)) in 2002 shall each be adjusted by multiplying such amount by the inflation adjustment factor for the calendar year in which the sale occurs. If any amount as increased under the preceding sentence is not a multiple of 0.1 cent, such amount shall be rounded to the nearest multiple of 0.1 cent. That is a lot of words that will be difficult for most people to decipher; what it means in actual practice is that in March 2014, the date when Lovins made his comment, the wind energy production tax credit was 2.3 cents per kilowatt hour with a preplanned inflation adjustment. That credit also lasts for 10 years after a facility inservice date. In contrast, the Energy Policy Act of 2005 section 1306 provides a production tax credit for advanced nuclear power facilities — defined in the act to be a nuclear power facility placed into service between August 2005 and January 1, 2021 AND with a reactor design approved by the Nuclear Regulatory Commission after December 31, 1993 — of 1.8 cents per kilowatt hour, with no inflation adjustment, for 8 years after the inservice date, with a 6,000 MWe capacity limit nationwide, and a per facility limitation of $125 million. Does that sound like a production subsidy slightly bigger than wind gets? There is not one, but at least two reactor construction projects underway in the US that are financed by private investors using money borrowed from the traditional banks that have always financed electric utility construction projects. VC Summer units 2 and 3 have received no federal loan support and are 100% financed by the normal capital markets. The democratic process in the state of South Carolina has provided SCANA and its other partners with a guaranteed customer contract, but that is nothing new to the capital intensive electric utility industry. I’ll leave additional deconstruction of the Amory Lovins March 28, 2014 talk at Dartmouth to the comment section. PS (Added at 11:16 August 10, 2014) Starting at time mark 51:57, Dan Richter asks a question about natural gas price volatility. Though I disagree strongly with Lovins’s assumptions about unreliable energy supply systems and the potential for energy efficiency growth, I agree with his statements about the high risk of continued natural gas price volatility. One of the great ironies in today’s America is that a two time college drop out and Friends of the Earth campaigner who strongly advocated for increasing coal use is often held up as a hero of the environmental movement while also making a lot of money as a consultant for the natural gas industry, Wal-Mart and the Department of Defense. I am, of course, talking about Amory Lovins, the founder of the Rocky Mountain Institute (RMI). It’s worthwhile to review the article that helped to launch Lovins’s career as a “consultant experimental physicist” – those are the words used in his blurb on RMI’s Staff List. His attention-getting article appeared the October 1976 issue of Foreign Affairs is still pointed to as one of the seminal thought pieces that helped launch alternative energy programs. It outlined an energy strategy choice between the “hard energy path” and the “soft energy path”. For historical purposes many people asked that we re-release our 1977 paper, “Energy Strategy: The Road Not Taken?”. Unfortunately it is still very current, even though it has been out of print for decades. Where are America’s formal or de facto energy policies leading us? Where might we choose to go instead? How can we find out? Addressing these questions can reveal deeper questions — and a few answers — that are easy to grasp, yet rich in insight and in international relevance. This paper explores such basic concepts in energy strategy by outlining and contrasting two energy paths that the United States might follow over the next 50 years — long enough for the full implications of change to start to emerge. This article, by Amory B. Lovins, appeared in Foreign Affairs (www.foreignaffairs.org), October 1976, and is reprinted by kind permission of the publisher. Copyright 1976 by the Council on Foreign Relations, Inc. (November 1977). Notice – there is not a hint of repudiation or revision in that description. Based on their own words, I would presume that the following still represents a part of the organizational view regarding future energy strategies. 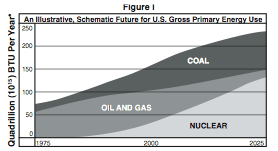 Excerpted From Energy Strategy: The Road Not Taken? Neglected for so many years, coal technology is now experiencing a virtual revolution. We are developing supercritical gas extraction, flash hydrogenation, flash pyrolysis, panel-bed filters and similar ways to use coal cleanly at essentially any scale and to cream off valuable liquids and gases as premium fuels before burning the rest. These methods largely avoid the costs, complexity, inflexibility, technical risks, long lead times, large scale, and tar formation of the traditional processes that now dominate our research. Perhaps the most exciting current development is the so-called fluidized-bed system for burning coal (or virtually any other combustible material). Fluidized beds are simple, versatile devices that add the fuel a little at a time to a much larger mass of small, inert, redhot particles—sand or ceramic pellets—kept suspended as an agitated fluid by a stream of air continuously blown up through it from below. The efficiency of combustion, of other chemical reactions (such as sulfur removal), and of heat transfer is remarkably high because of the turbulent mixing and large surface area of the particles. Fluidized beds have long been used as chemical reactors and for burning trash, but are now ready to be commercially applied to raising steam and operating turbines. In one system currently available from Stal-Laval Turbin AB of Sweden, eight off-the-shelf 70-megawatt gas turbines powered by fluidized-bed combusters, together with district-heating networks and heat pumps, would heat as many houses as a $1 billion-plus coal gasification plant, but would use only two-fifths as much coal, cost a half to two-thirds as much to build, and burn more cleanly than a normal power station with the best modern scrubbers. 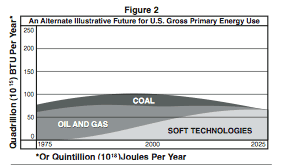 Properly used, coal, conservation, and soft technologies together can squeeze the “oil and gas” wedge in Figure 2 from both sides—so far that most of the frontier extraction and medium-term imports of oil and gas become unnecessary and our conventional resources are greatly stretched. Coal can fill the real gaps in our fuel economy with only a temporary and modest (less than twofold at peak) expansion of mining, not requiring the enormous infrastructure and social impacts implied by the scale of coal use in Figure 1.
paths” recommended by Amory Lovins in October 1976 in a magazine published by the Council on Foreign Relations, just before the election of President Jimmy Carter. It might not have reached a broad audience, but I am sure that the article was carefully read by policy wonks inside the Washington Beltway. When I get a chance, I will find the graph that I have somewhere in my files that would be figure 3 – the real energy path that was taken during the 30+ years since Lovins wrote the frequently referenced article that helped to define the energy policy actually followed.